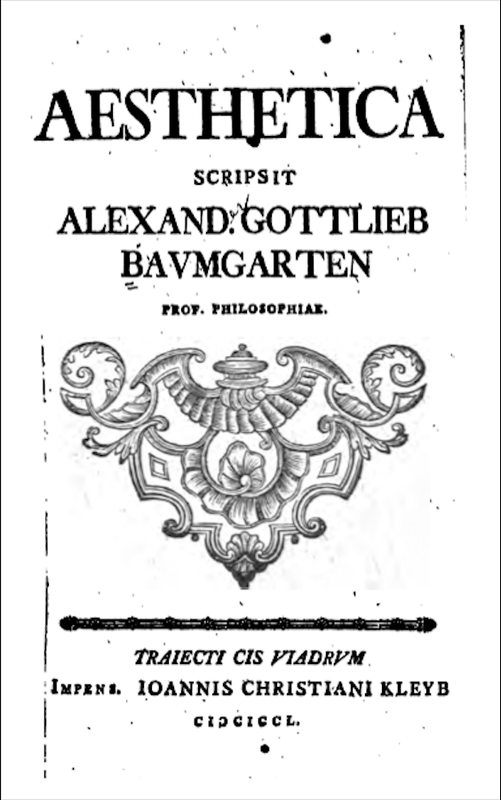 Alexander Gottlieb Baumgarten, in his work Aesthetica (2 Volumes: 1750—58), appropriated the word “aesthetics” and gave it the meaning by which it is understood today. But Baumgarten cannot be regarded as the founder of aesthetics—that distinction belongs to Immanuel Kant. The modern philosophy of aesthetics is based largely on Kant’s The Critique of Judgement. Even our acquaintance with Aesthetica is modeled by two comments that Kant has made, the first in his The Critique of Pure Reason, and the second in his The Critique of Judgement. Mary J. Gregor’s, in her interesting essay, “Baumgarten’s Aesthetica,” explains the nature of the project that Baumgarten had undertaken in Aesthetica. 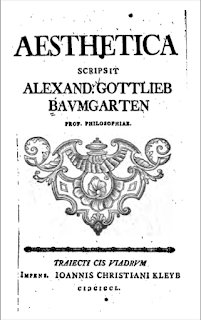 Baumgarten wanted to establish a theory of liberal arts which is based on theory of knowledge. That aesthetics is, in Baumgarten’s view, an art as well as a science may be unfortunate from the modern reader’s point of view: it accounts for the concern with “rules” which makes a part of the Aesthetica philosophically uninteresting. Yet the only “rules” to which Baumgarten commits himself without reservation are innocuous applications of his philosophical tenets. At this most general level, his position is simply that theoretical knowledge of how the components of sense cognition function will yield very general percepts for directing this sort of cognition to its proper perfection. There is in man a “natural logic,” innate intellectual powers which will develop regardless of any theoretical knowledge about their nature. So too there is in man a “natural aesthetic,” which the child exercises in the normal process of looking, listening, and particularly playing games. Man’s intellectual and aesthetic powers will, under favorable conditions, develop of themselves as he exercises them. Whether these powers will reach the perfection of which they are capable is, however, dependent on circumstances, and their development need not and should not be left to chance. Natural logic can and should be controlled by the rules of acquired or “artificial” logic. So too, natural aesthetic can and should be controlled by the rules of acquired or “artificial” aesthetic, derived from knowledge of the lower cognitive power. There is in man an innate capacity to find the connection of things by “the law of the third term,” but the rules of logic can prevent mistakes in reasoning. So too man has an innate disposition to find connection of things by associating ideas, but the rules of aesthetics prevent mistakes in connecting ideas by virtue of their association. We make a logical blunder when we assert a connection of distinct ideas that is not sanctioned by a distributed middle term. We make an aesthetic blunder when we associate indistinct ideas on the basis of some purely subjective ground which yields a chimera, incommunicable to others through sensible signs. Baumgarten’s claim for art is a modest one: given the nature of man his perfection requires the development of his potentialities for both perception and discursive reasoning. Because the two modes of perfection, perceptual and discursive, are different, there can be no displacement of art by science. The work of art is not a symbolic form, but rather the use of signs (and, in the case of literature, symbols) to articulate perceptual form. Since the work of art is not a symbol, its role cannot be usurped by the symbolic product of man’s higher cognitive power. Reason, according to Baumgarten, is “superior” in finite spirits, i.e., minds incapable of intellectual intuition, but only in “weightier matters,” such as science and morality. But “to posit the one [kind of knowledge] is not to exclude the other.” Hence art—perfection perfected—is assured a permanent place in human experience. Modesty may have its own rewards.